STICK-IT’ is an unbelievable routine showing a prediction on the back of any card named by a Spectator. A stunning piece of magic! Your spectator thinks of, and names, any playing card. You run through the deck to find the Spectator’s chosen card. On the back of their named card is a silver sticker to prove that you have predicted this card before they chose it. Everything can then be examined if the Spectator wishes to. Alternatively, have a Spectator choose a card for example, the 3 Diamonds. Invite another Spectator to name a different card for example, the 6 Clubs. You run through the deck and locate the 6 Clubs. On the back of the 6 clubs is a sticker that has 3 Diamonds written on it. Everything can then be examined. When you know the secret of ‘STICKIT’ you will, without doubt, be impressed. The prediction is your choice; the chosen card is a FREE choice. That’s what makes ‘STICK-IT’ unbelievable. An instructional DVD explaining everything you need to know; different options of set-up, 3 different routines and more. 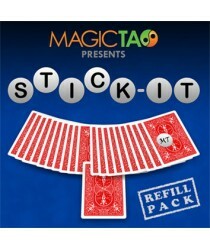 You receive 25 ‘STICK-IT’ gimmicks to get you started (refills will be available).